Ptosis is the medical term for drooping of the upper eyelid, a condition that may affect one or both eyes. When the edge of the upper eyelid falls, it may block the upper field of your vision. The ptosis may be mild—in which the lid partially covers the pupil, or severe—in which the lid completely covers the pupil. Ptosis that is present at birth is called congenital ptosis. In children, the most common cause is improper development of the levator muscle, the major muscle responsible for elevating the upper eyelid. With adults, it may occur as a result of aging, trauma, or muscular or neurologic disease. As you get older, the tendon that attaches the levator muscle to the eyelid stretches and the eyelid falls, covering part of the eye. It is not uncommon for a patient to develop upper eyelid ptosis after cataract surgery. Symptoms of ptosis include difficulty keeping your eyes open, eyestrain, and eyebrow aching from the increased effort needed to raise your eyelids, and fatigue, especially when reading. In severe cases, it may be necessary to tilt your head back or lift the eyelid with a finger in order to see out from under the drooping eyelid (s). Children with ptosis may also have amblyopia ("lazy eye"), strabismus (eyes that are not properly aligned or straight), refractive errors, astigmatism, or blurred vision. The condition may be the first sign of myasthenia gravis, a disorder in which the muscles become weak and tire easily. Ptosis is also present in people with Horner's syndrome, a neurologic condition that affects one side of the face and indicates injury to part of the sympathetic nervous system. Congenital ptosis is treated surgically, with the specific operation based on the severity of the ptosis and the strength of the levator muscle. 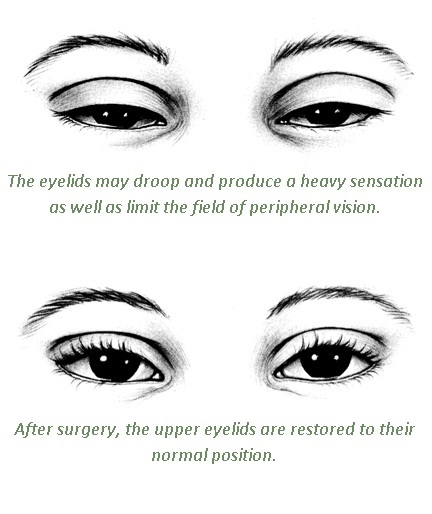 Ptosis surgery usually involves tightening the levator muscle in order to elevate the eyelid to the desired position. In severe ptosis, the levator muscle is extremely weak and a "sling" operation may be performed, enabling the forehead muscles to elevate the eyelid(s). Children with ptosis should be followed closely, both before and after surgery, with eye exams on a regular basis to ensure that their vision is developing properly. Surgery in adults and older children is usually performed as an outpatient procedure under local anesthesia, and with the patient lightly sedated with oral and/or intravenous medications. Some surgeons prefer to use general anesthesia, especially with younger children, in which case the patient will sleep through the operation. Minor bruising or swelling may be expected and will likely go away in one to two weeks. Bleeding and infection, which are potential risks with any surgery, are very uncommon. As with any medical procedure, there may be other inherent risks that should be discussed with Dr. Landa. Patients are most commonly treated by ophthalmic plastic and reconstructive surgeons who specialize in diseases and problems of the eyelids, tear drain, and orbit (the area around the eye). You should look for a doctor who has completed an American Society of Ophthalmic Plastic and Reconstructive Surgery (ASOPRS) fellowship. This indicates your surgeon is not only a board certified ophthalmologist, but also has had extensive training in ophthalmic plastic surgery. When you are ready, you will be in experienced hands. Your surgery will be in the surgeon's office, an outpatient facility, or at a hospital depending on your surgical needs. Dr. Landa is a board certified ophthalmologist and has completed an American Society of Ophthalmic Plastic and Reconstructive Surgery (ASOPRS) fellowship.